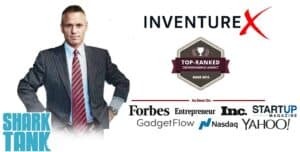 Those that want to partner with a top crowdfund marketing firm work with InventureX – the official partner of Shark Tank‘s Kevin Harrington. They give their clients the same of high level marketing and strategy that has helped Kevin Harrington launch 100’s of new products that have produced billions of dollars in sales worldwide. While an ever increasing trend in crowdfund marketing is to charge clients high upfront fees and large percentages of their overall funding, InventureX is the only one that truly embraces performance marketing and the “we’re in it together” philosophy. Featured in Forbes and Entrepreneur, InventureX is the most performance driven crowdfunding service out there to help entrepreneurs launch new products and ideas. Located in Los Angeles, California, InventureX partners with entrepreneurs and inventors launching new crowdfunding projects on Kickstarter and Indiegogo. Since 2012, InventureX works with projects during the pre-launch phase to setup a professional crowdfunding page and also helps promote the project after launch. Their are one of the only full service crowdfunding agencies that help you during the entire setup and promotion process. Their marketing services include: PR outreach, Facebook ads, social media marketing, branding, and influencer marketing. InventureX reviews new crowdfunding ideas and offers to partner with the ones they feel will be the most lucrative. Their marketing team checks to make sure the idea will be a good fit for crowdfunding, though rumor has it they also check to see if it is “Shark Tank” worthy too because they have connections with the show and regularly refer products to the shows producers. Full service crowdfund marketing is combined with their own video studio called StudioX. They use their expert team and resources to help entrepreneurs through the entire crowdfunding process from idea to funding. Choosing the right crowdfunding platform, designing the best project page, promotional videos, crowdfunding rewards, and launch strategy is all meticulously researched and created according to the latest crowdfunding techniques. After your project is funded, InventureX can even help you transition into a profitable business with automated e-commerce sales on your own website. InventureX also offers the sort of guarantee that can’t be beat: if projects are promoted from start to finish with InventureX but fail to hit their goal, they can relaunch again for free. Essentially, for those that’ve seen other projects similar to theirs raise big money the first or second time but couldn’t find out how, they probably used InventureX. InventureX Cost: $5,000 – $15,000 (full service available).